A long time ago, there lived a man named Tami Towjatuwa in riparian areas of Irian Jaya. The man was upset, because his wife was pregnant and had difficulty in giving birth to her baby. To assist the birth of his son, he needs an operation that uses a sharp stone from the river Tami. When he was busy looking for the sharp rocks, he heard strange noises behind him. Towjatuwa was surprised when he saw a large crocodile in front of him. He was terrified and almost fainted. Big crocodile was slowly moving towards Towjatuwa. Unlike other crocodiles, this animal has feathers of birds Kaswari on his back. So that when the crocodile was moved, the beast looks very scary. 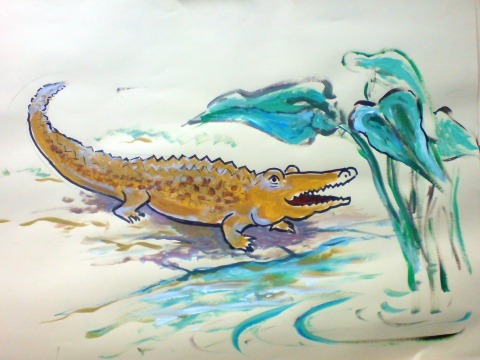 But when Towjatuwa tried to escape, the crocodile was greeted with a friendly and asked what he was doing. Towjatuwapun tell the state of his wife. Even this magic crocodile said: "Do not worry, I will come to your house tonight. I will help your wife give birth." Towjatuwa home to his wife. Very happy with the price, he tells about his encounter with a crocodile magic. That night, as promised, crocodiles and even then entered the house Towjatuwa magic. With the power of magic, crocodile named Watuwe it helped the birth of a baby boy safely. He was named Narrowra. Watuwe foresee the baby will grow up to be a reliable hunter. Watuwe then reminded that Towjatuwa and his descendants did not kill and eat crocodile. If the ban is violated then Towjatuwa and his descendants will die. Since then, Towjatuwa and offspring have pledged to protect the animals that were around the river Tami from the hunters.